You are here: Home » Featured » What the Higgs Is a Boson? What the Higgs Is a Boson? Science is worthwhile for its own sake — even if normal people don’t understand it. The Higgs boson is a particle that has been sought by physicists for years. Named for physicist Peter Higgs, the particle is the counterpart of the “Higgs field” which is hypothesized to fill all of space, and which lends to ordinary matter its property of mass. The Higgs’ importance lies in this fundamental role it plays in the behavior of the material universe, and also in the fact that it is the final major component of the “Standard Model” of particle physics, the basic framework that describes physicists’ current understanding of nature at a fundamental level. If the Higgs is found, it indicates that physicists are on the right track. Failure to find the Higgs would indicate that something somewhere has gone astray. 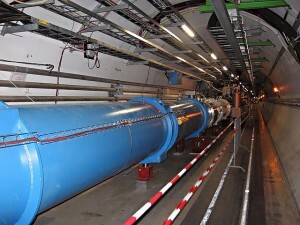 Two weeks ago, researchers with the European organization CERN announced the discovery of a new boson “consistent with the Higgs.” Two independent teams working with CERN’s Large Hadron Collider have detected signs, with significant confidence, of a Higgs-mass boson in the showers of debris created by the collider’s energetic experiments. While formal pronouncements have been prudently guarded, the general consensus is that yes, indeed, the Higgs has been found. There are economical questions, to be sure, about such a discovery. It takes a lot of money to smash protons together at significant fractions of the speed of light and examine the remains for long-hypothesized elements of nature. Not a lot of economic revenue comes of it, either. Perhaps we might sell Higgs t-shirts, but the payoff is finally in knowledge, not dollars. Some, too, have complained about an unnecessarily religious spin that has been put on the discovery of the Higgs boson, especially in its nickname of the “God particle.” While I agree that the nickname is misleading and largely used just to gin up interested by the media, I have in fact been impressed by the propriety with which the scientific community has handled the announcement. To begin with, the team at CERN announced their findings with excitement but also with scientific prudence, cautioning that definitive identification of the newly-found boson as “the Higgs” would take some time. Second, while I’m sure that some searchers of the Internet might find a few examples to the contrary, the scientific commentary on the Higgs has largely been to present it as exactly what it is: a milestone in particle physics, not a revolution in theology. In fact, scanning both the scientific and religious media, both of which have my sympathy, I have found in my own reading more articles cautioning against over-theologizing the Higgs than I have found by writers actually committing that error! The “God particle” moniker has been bandied about, but no serious attempts have been made, that I am aware of, to proclaim that the discovery of the Higgs boson actually plays a revolutionary theological role. The point is that the discovery of the Higgs boson, long awaited as it has been, is important in the world of particle physics, and remains important there. It changes nothing in the economical scheme, provides no grand source of power of nature, and doesn’t even serve any new philosophical or theological end. It is an important scientific discovery which is forced to stand on its own. That doesn’t mean, however, that it cannot be viewed in the broader light of the human intellectual tradition. Fr. James Schall, S.J., political science professor at Georgetown, writes in his book The Order of Things: “We are beings who are moved by the ‘wonder of the world’ — that is, we wonder at the world, how it is, that it is, why it is. Plato speaks of this philosophic eros to remind us that seeking the truth of things is no indifferent activity of our souls.… We are beings who want to know — and to know the truth.… [W]e are made to be such beings that our very unknowing challenges us, unsettles us so that we seek to know the what is of everything we encounter, including ourselves.” Fr. Schall would add that, if we are beings whose nature it is to know, we are meant to finally know our Creator “face to face,” as Saint Paul puts it. This religious aside is not entirely out of place, for if it is true that human beings find their ultimate fulfillment in seeing or in knowing, it is not surprising that we find, in the meantime, some temporary fulfillment in knowing things about the world in which we find ourselves, even when those things we come to know serve no immediate purpose. In other words, it may very well be that our human drive to do science, to simply know about the world around us, acquires its power from our nature as beings meant to finally know the source of all things. There are, in the final analysis, some things that we do simply because it is good in itself to do them. Man is called to know. It is his nature. Thus we cannot help but philosophize. Thus we find in science, pure science which does not simply seek to exercise power, some hints of the noblest aspects of ourselves. The Higgs has no yet foreseeable service in furthering man’s economic mastery of his environment. It plays no revolutionary theological role, being particularly no more and no less a sign of the Creator than any other element of nature. The Higgs boson is, in a sense, useless. Yet it is still good to know about it, because it is a human good just to seek to know. Michael Baruzzini writes from Colorado Springs, where he lives with his wife and three children. He blogs on Catholicism and science at www.deepsoftime.com.